During the highly anticipated Marvel presentation at San Diego Comic-Con, the studio revealed some "totally rad" information about its upcoming Captain Marvel film, which stars Brie Larson in the title role. Marvel head Kevin Feige announced that the film will be an origin story set in the 1990s. That's not all: Captain Marvel will also feature a two-eyed Nick Fury, played by Samuel L. Jackson, joining in on all the enemy-slaying fun. But who exactly are the enemies in Captain Marvel? Feige announced that as well. Larson's superhero character Carol Danvers/Captain Marvel will take on the Skrulls, a race of eerie shape-shifting aliens. An early invention in the Marvel Comics canon, the Skrulls debuted in the 1961 issue Fantastic Four #2. The mythology depicts them constantly at battle with another race of aliens known as the Kree, who just so happen to be responsible for devising the exact technology that granted Carol her powers in the first place. Larson previously said of her character: "She's a believer in truth and justice and she is a bridge between two worlds, Earth and space. She's fighting between the flaws that are within her and all this good she wants to try and spread and make the world a better place. She can also fly and shoot things out of her hands. And she's really funny!" 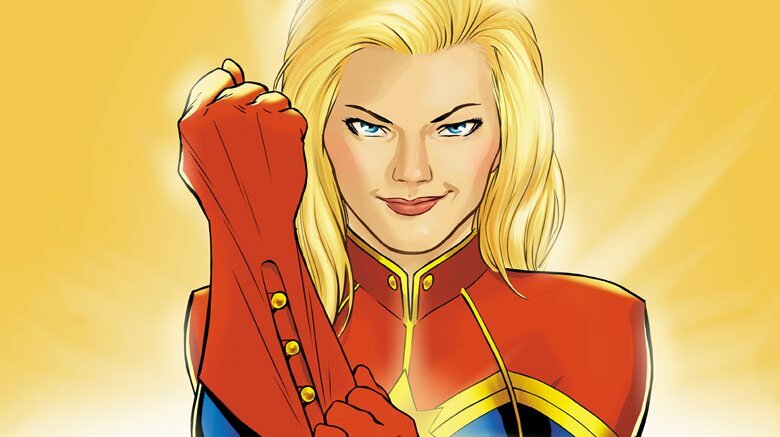 Directed by Anna Boden (It's Kind of a Funny Story) and Ryan Fleck (Mississippi Grind), Captain Marvel is set for release on March 8, 2019. Until then, find out how Larson became Carol Danvers.